Last February 2019, Hyundai Asia Resources, Inc., (HARI) marked an industry first by opting to market its Reina sub-compact sedan directly through O Shopping—a TV and online shopping network. 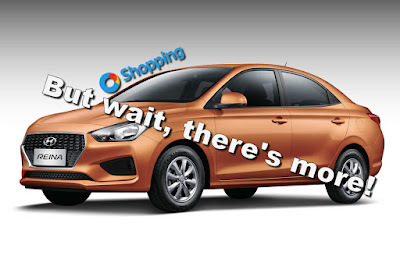 At the time, HARI said that they won’t be selling cars directly on O Shopping, but will merely use the network to highlight the various features of its newest sub-compact sedan. But, in a twist worthy of home shopping networks, there’s more, way more. Okay, so you can’t buy it off the website just yet, but you can request for a quote or make a reservation online. Scrolling down, you can go through all the Reina’s key features and even check out how much you have to fork out if you opt for the Reina’s low-down, 60-month amortization (spoiler alert: it’s P 46,000 for the M/T and P 52,000 for the A/T). But wait, there’s more. Since this is a home shopping network, you get some exclusive O Shopping freebies too. For instance, all Hyundai Reinas reserved through O Shopping gets the would-be buyer a P 2,000 Shell Fuel Card (via Shell Go+ Card). And to top it off, you get a 20 percent discount on PMS parts and labor for the lifetime of the unit. Dang, that’s one sweet deal right there.